2ఏ వగగానైనను – ఏ అపకారియైనను – the latter version is wrong. 2ஏ வக3கா3னைனனு – ஏ அபகாரியைனனு – the latter version is wrong. 2ಏ ವಗಗಾನೈನನು – ಏ ಅಪಕಾರಿಯೈನನು – the latter version is wrong. 2ए वगगानैननु – ए अपकारियैननु – the latter version is wrong. 2ē vagagānainanu – ē apakāriyainanu – the latter version is wrong. 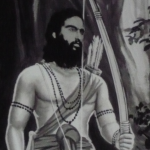 O Lord Rama! I have believed totally that Your feet alone as my refuge. O Supreme Lord rAma who is effulgent as The One Perceived in Veda and Vedanta! The World is full of sinful acts; I am unable to undergo suffering here; O Lord praised by this Thyagaraja! Please govern me by any means whatsoever. Eventhough this krithi contains the Thyagaraja mudra, it is not composed by Saint Thyagaraja. The details can be obtained from the following website. Any way nice website, good effort.